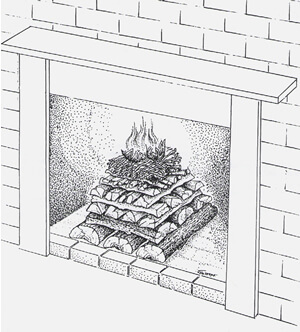 A fireplace grate is not necessary with the above. A grate increases your critical burn rate allowing logs to burn faster than normal. Logs burn best in contact with hot firebrick in a bed of wood ashes. Make sure your fireplace and flue have been inspected for fire worthiness and are cleaned if found dirty (full of flammable creosote) by a reputable chimney sweep before you build a fireplace fire. Make sure damper is open. If none is present, have a top mount version retrofitted. The retrofit is a tremendous energy saver and assists in keeping out animals, noise, and pollution. If your fireplace and flue are located on an outside wall or when the damper is open and you feel a flow of frigid air, pre-heat the flue with a sheet of lit newspaper. Hold high into the damper area, wearing a pair of stove gloves for protection. This will reverse the cold air plug present in the flue, creating a strong updraft with no smoke into your room. As soon as the above is completed, light your newspaper on top of your fuel load. Approximately 3-4 hours later when you have a nice bed of hardwood coals, use a fireplace rake to push the coals against the rear wall of the firebox. Next, lay your new logs, minimum of four, on top of the hot coals, lay the bottom two horizontally. The top tow, a little shorter in length, place front to back approximately 3 inches apart creating a throat. The greatest volume of smoke and particulate pollution from a wood fire occurs during a cold start up. Wood fires lit from the bottom, in a conventional manner, promote a dirty burn and waste a large amount of potential heat in the form of unburned gasses. A clean and efficient method for kindling a fire is a top burn. This almost forgotten ancient European technique places the largest wood at the bottom in a crisscross crib fashion. As each tier is laid, the crisscrossing becomes smaller. Kindling and a small amount of paper are placed on top and lit. When the top burn fire is lit, the flames are always above the fuel load. The smoke and flammable gas from each tier of wood will always travel up through the flame and burn, thereby reducing particulate pollution and unburned fuel. A top kindling fire also produces large and less compacted glowing coals, providing excellent long-lasting radiant heat. A top burn fire laid with seasoned hardwood to a height of eighteen to twenty-four inches will burn approximately four hours without adding additional wood. The fire will be mesmerizing as each tier slowly ignites and burns its way down. Three good sized pieces of split hardwood five to six inches thick, laid front to back. Three slightly smaller pieces of split firewood three to five inches thick, laid side to side. Four to five smaller pieces of split firewood two to three inches thick, laid front to back. Keep alternating and decreasing in size with split hardwood until they are about one inch thick. Now alternate two rows with split softwood (pine, spruce, etc.) until pencil thick. Place a small piece of newspaper on top and light. Did you know that when an unsuspecting homeowner invites a service company into the home to do work, that the HOMEOWNER may be responsible for injury to a workman if the company does not have Workers’ Compensation Insurance? Check on our insurance https://www.mass.gov/how-to/check-for-workers-compensation-insurance. 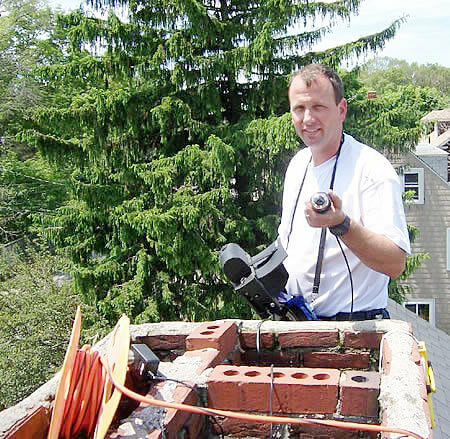 Four Seasons Chimney Service proudly holds Massachusetts Home Improvement Contractor’s (HIC) License #120784. An HIC license is required by the Commonwealth of Massachusetts for any contractor who may be doing more that $1,000 worth of work for a homeowner.